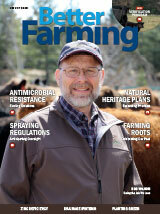 Better Farming May 2017 edition features Bob Wilson on the front cover and the following articles: Antimicrobial Resistance - Finding Solutions, Natural Heritage Plans - Balancing Priorities, Spraying Regulations - Anticipating Oversight, and Farming Roots - Celebrating our past. 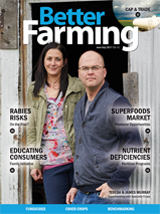 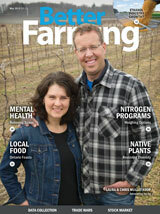 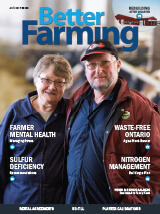 Better Farming April 2017 edition features Peter & Rensje Aalbers on the front cover and the following articles: Farmer Mental Health - Managing Stress, Sulfur Deficiency - Recommendations, Waste-Free Ontario - Ag as Front-Runner, and Nitrogen Management - Building a Plan. 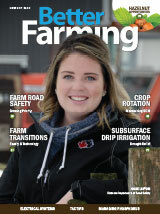 Better Farming March 2017 edition features Josie Linton on the front cover and the following articles: Farm Road Safety - Growing Priority, Farm Transitions - Family & Technology, Crop Rotation - Maintaining SOM, and Subsurface Drip Irrigation - Drought Relief.